We also carry a wide selection of menswear pieces for purchase: Coats, pants, ties, socks, pocket squares, suspenders, cummerbunds, etc. 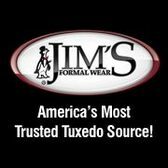 Jim's Formal Wear Company (est. 1964) is one of the nation's largest and most respected wholesale distributors of men's formalwear in the United States. Visit American Rose Bridal to view a selection of tuxedos and swatches for rental. Poulsbo's authorized Jim's retailer.